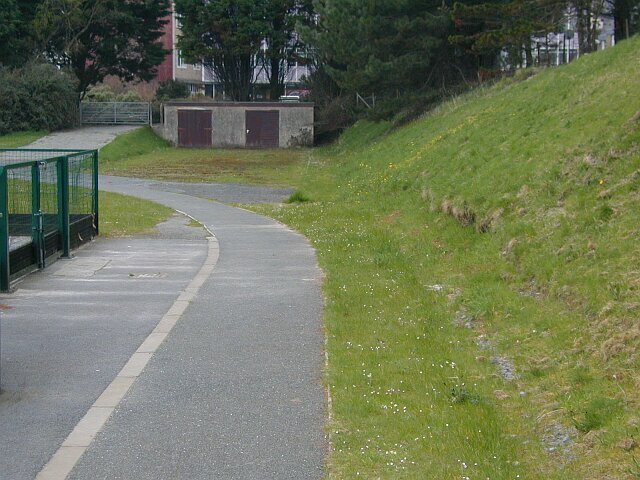 This is a 400m tarmacadam, one lane jogging track around the University synthetic football/hockey pitch and was believed to have been built in about 1998 or 1999 and replaced a 6 lane 400m/440y red cinder track. The original track had a 200y (not metres) 6 lane sprint straight and both ends of this can still be seen and with a little deviation it is still possible to run the full length of it as the centre of the 1 lane track is roughly inline with the outer curb of the old track. There are some distance markings painted on the track and the start line is in an unusual position at roughly the 100m start of what was the "extended" straight. Alan Carter did 16.60 for the SP here on 11 May 1963 which is in UK all-time list. The SP circle is the only field event facility still visible.